Mary Charles Robbins’ (above with Bandit) business sense told her she could fill a niche market by just focusing on selling dolls and dollhouses. Plus, it meant carrying merchandise she cherished. Journal photo by Sarah Kuper. 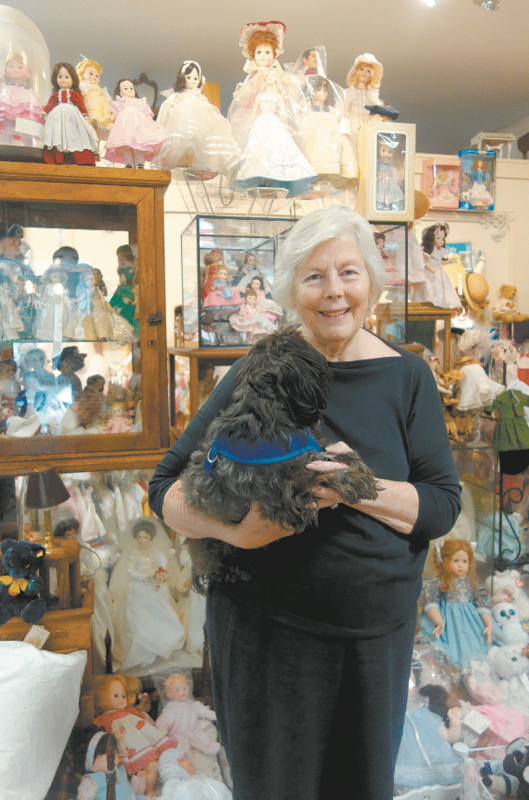 It has been 40 years since 82-year-old Mary Charles Robbins opened her fine doll and miniatures store in Mountain Brook Village. Originally intended as an antique store, she and four other ladies opened the shop with no retail experience or seed money. They soon learned there was a high demand for antique dolls, accessories and doll repair services. Robbins’ business sense told her she could fill a niche market by just focusing on selling dolls and dollhouses. Plus, it meant carrying merchandise she cherished. Not many octogenarians can say they still own and operate a small business, but Robbins said she has had tremendous support from the community. Although, she said, lately it seems business is trending downward. Now, looking around Robbins’ store, shoppers see baby dolls in lace gowns, elegant porcelain brides and well-appointed dollhouses filled with detailed miniature furnishings. Madame Alexander dolls and Steiff teddy bears welcome customers as they search for a new frock or miniature chaise lounge. On the shelves are classic Barbie dolls in the likeness of famous beauties such as Grace Kelly and Vivian Leigh as Scarlett O’Hara. But the celebrities in Robbins’ life aren’t just in display cases. People such as Roy Rogers, Amelia Earhart and Mickey Rooney are in her family photo albums. Long before Robbins’ shop became the destination for people wanting to adorn flawless porcelain dolls, she had an appetite for the glamour of real, live beauty queens and celebrities. Robbins’ father, Charlie Preston, was a talented photographer and he documented the many famous people who visited Birmingham in the ‘30s and ‘40s. As she remembers it, Robbins said, Mickey Rooney was the liveliest, while Roy Rogers was surprisingly reserved and quiet. Robbins’ father was also a pilot, so when Amelia Earhart came to Birmingham, she accepted an invitation to eat with the Robbins family. “My brother found a picture of her sitting on a sofa that we had. She had signed and dated it,” Robbins said. Robbins and her siblings frequently accompanied their father as he photographed famous people, and she said that, while it was exciting, it became sort of routine. “I was so young, and we didn’t think anything of it, it was almost normal,” Robbins said. Robbinss, who lives in Homewood, said she has fond memories of her girlhood and her brief encounters with fame and fortune, but she doesn’t believe it shaped who she has become as an adult. If anything, she believes it was her years playing with dolls that prepared her for life as a mother, wife and business owner. Meanwhile, Robbins and her dog, Bandit, will be happily situated in Mountain Brook Village in the Doll House that bears her name.